Philips launches OLED+ 903 TV with Bowers & Wilkins sound system | What Hi-Fi? Fancy an OLED TV with B&W sound? Want high-quality sound to match your 4K OLED picture? Philips and B&W might have the answer. 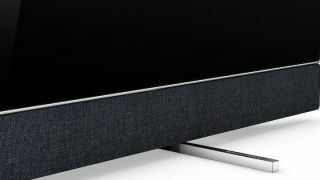 The new OLED+ 903 TV, launched at this year's IFA show, features an extensively redesigned and upgraded sound system - Sound by Bowers and Wilkins. The new flagship Philips OLED will launch in October in 55in and 65in screen sizes, sitting above the OLED 803 launched with the rest of the Philips 2018 TV range earlier in the year. The sound system features new B&W drivers throughout, with a rear bass enclosure sporting a low frequency driver and twin radiators. There are forward-firing titanium twin tweeter/midrange drivers - an upgrade on the paper drivers of the 803 - and upgraded DSP sound functionality. In terms of picture performance, the set features Philips' second-generation P5 processing engine and the company's trademark three-sided Ambilight functionality. Inside is the Android TV operating system, quad-core processor and 16GB of expandable memory. An upgrade from Android N to Android O will bring Google Assistant voice control, too. The new OLED was teased earlier in the month, when Philips announced the set had won an EISA Award ahead of IFA. Philips also confirmed the release of the OLED 803, which sports a similar spec to the 903, minus the B&W sound system. It will work with Google Assistant and Amazon Alexa after the Android O update, promises 10% peak light output improvement to 1000 nits, HDR 10+ processing and a new Perfect Natural Reality processor for improving SDR pictures. What about the all important prices? Well, essentially there's a £500 premium for the B&W sound system. The 55in Philips 803 OLED will be £1999, while the 65in will be £2999. The OLED+ 903 will cost £2499 for the 55in and £3499 for the 65in.